Xtar has a new charger on the market the X2 and X4. Today I have a review of the X2, a 2 bay 2A charger capable of charging Li-ion and Ni-MH batteries, with AC or USB Power. Thanks to Xtar for sending this to me to test and review. The packaging is a white retail box with a gloss photo of the X2 on the front. The sides list a few key features such as the charging speed, Inputs, LCD display, the chemistries and sizes of batteries that are supported. The back gives more specifications and features of the charger. It contains a scratch off anti counterfeit sticker and is insured worldwide. The package contains the charger, AC power cable, and the manual. The Xtar X2 charger is a 2 bay charger that can accommodate most common battery sizes. I had no trouble with all 18650’s, it will fit 2x 26650, and I didn’t have any issues with an unprotected 20700. Smaller batteries were ok too, 18350, AAA, etc. It will not charge a protected 21700 battery. The metal sliders are fairly smooth and have enough tension on them to hold a battery securely. The body of the charger is a black ABS plastic that is heat and flame retardant, and is kind of in an X configuration, in outside appearance. There isn’t a fan in this charger meaning it’s silent, and I didn’t notice it get warm during use. There is one button on the top, middle near the screen that when held turns the screen off, for night time charging if you wish. I took some photos of the inside of the charger here. I am not a circuit engineer but to me it looks decent. Quality of the solder joints look good, A few components are not 100% squarely placed but not bad either. I don’t see any cold joints or things that I am alarmed about. If you see something you are concerned about, make sure to leave a comment. My main charger for a while has been an Xtar VC4 which I really like, but the problem with it is it’s USB only input power, sometimes if charging performance isn’t what I expect I end up doing the dance of “is it the USB power supply? Or the wire, or something else?” The X2 solves that because it’s a part of Xtar’s AC series, meaning it plugs directly into the wall. You can also power it via MicroUSB if you prefer. For my tests I used the AC power source. The charger has reverse polarity detection and didn’t charge batteries when they were placed in backwards. Battery chemistry was correctly identified, when you place a new cell in it takes a few seconds for it to go through detection and begin charging. The charger is capable of a maximum of 2A across both bays. The left bay is capable of up to 2A under the correct conditions, and the right bay is capable of up to 1A under the correct conditions. If there is only 1 battery in the left bay and it’s a lithium ion type chemistry it will charge at 2A. If you have 2 Lithium cells they will each charge at 1A. The charger does a great job of recognizing the type of cell, my smaller 18350’s despite being lithium will charge at a slower 0.5A rate which is great for battery longevity. It detects this all on it’s own and it does this in either bay. You can also mix chemistries across the charger, 1 18650 for example in the left bay and one AA NiHM in the right, it will charge the 18650 at 1.0A and the NiHM at 0.5A. While slower charging is safer, I would like to see the charger capable of a combined 4A across each bay, for faster charging of large batteries like 26650 and 20700’s etc. The charger has 0V activation (Although this is generally not recommended for batteries with a Lithium chemistry). For charging it has a 3 step process TC-CC-CV with soft start technology. This helps with overall battery longevity and long term health. All automatic, this make the charger very easy to use but doesn’t give enthusiasts any options on what speed to charge the batteries at. Default settings are conservative, which is safe. Very affordable, at US retailers it’s coming in well under $20. Only a combined total of 2A charging speed, while adequate, I would like to see it able to charge 2A per bay in 2019 if connected via AC. The Xtar X2 is my current favorite 2 bay charger. I really like that it’s got dual input including AC, which makes it versatile to use whatever power source is best for you in your situation. It takes a wide variety of sizes of batteries, and the most common chemistries as well. Xtar has a good reputation around the Flashlight and Vape communities for making quality chargers at affordable prices. The X2 is no different, and continues this trend. Xtar also makes the X4 version of this charger if you want 4 bays. It offers a little faster charging depending on where you put batteries and isn’t much more expensive. Either charger would be great for anyone who is just getting into flashlights or if your just looking to upgrade to a newer/faster charger. I recommend it. Today on my review table I have the Sofirn Q8, this is a version of the well regarded BLF Q8 that I reviewed last year. This review is mainly showing the differences between the two lights. If you haven’t seen my original review of the Q8 you will want to check it out first and then watch or read this review. Thanks to Sofirn for sending this to me to take a look at. So as you might know the BLF was a forum designed light, it was produced by Thorfire. The contact that BLF had at Thorfire changed employers and went to work for Sofirn. WIth everyone’s permission he was allowed to take the BLF Q8 design with him and Sofirn decided to make a few changes to the light and produce it under their name. There are 2 significant changes on the Sofirn Q8. On the BLF Q8 there were milled flat’s into the body tube, on the Sofirn Q8 those have been removed, and it’s now purely knurling. I don’t have strong feelings on if this is a good or bad change. The additional knurling does add some additional grip. The Sofrin Q8 uses the Cree XPL HI LED’s in a 6000k temp. The BLF Q8 uses the Cree XP-L V6 HD LED with a 5000k tint. What does this mean practically? It means the Sofrin Q8 has a slightly cooler beam tint, and throws slightly better because the XPL HI LEDs don’t have a doam. From a practical standpoint I actually like the slight increase in throw that the light has, in my night shots you will see it’s noticeable but not a dramatic difference. I wish the Sofrin had a tint closer to 5000k but the 6000k isn’t too blue. Overall I think the slight increase in throw is worth it. I did do a runtime test with the Sofrin Q8 using 4x Samsung 30Q batteries and the graph shape matched the BLF Q8 but overall runtime as a bit shorter. The Sofrin Q8 came in at 325 minutes while the BLF Q8 was just past 350 minutes. Other then the changes mentioned above the Sofirn Q8 is the same as the BLF Q8. I was a really big fan of this light originally and still am. It’s a fantastic value for a soda can style light, it has the all important tripod mount (Or lanyard attachment point). The firmware is the excellent Narsil so it’s configurable and in my opinion is one of the best ramping firmwares out there. As far as I know most of the BLF Q8 mods should work on the Sofirn Q8. The light does get warm when you run it for an extended period of time but that’s to be expected on a light this compact and bright. Overall I enjoy both lights, if you are looking for a little more throw the Sofirn Q8 is a great choice, both are great lights and I recommend them highly. Jetbeam has a new product on the market that is aimed at videographers and photographers but has some application in the flashlight world as well. It’s a small portable fill light, with adjustable tint, and brightness, in a small package that’s made to be mounted on your camera or nearby to provide fill light when videoing or taking photos. Thank you to Jetbeam for providing this for me to take a look at. It’s been on my want list since it was announced. Packaging on this fill light is minimal. Outside is a retail box, unfortunately mine was damaged a bit during shipping. On the front it shows the light, on the back it gives a runtime charge we are used to seeing. Inside the light is housed in a plastic tray. Accessories with this are pretty minimal. It comes with a lanyard and USB-C OTG cable used to charge the light and it can be used to use the light as a powerbank to charge other devices. More on that a bit later. When I first put the Fl-12 in my hands the first thing I thought was, this feels alot like an iPhone. The sides and back are milled from a solid piece of aluminium, and then anodized in a silver. It looks to be very precise. The only downside as with many phones is that it makes it a little slick to hold onto. On the back an area is cut out near what I am going to call the top for a small OLED screen that gives you the status indicators. It displays what tint/temperature the light is outputting, the intensity level (available in 5% increments) and then the estimated runtime at that level and tint. Cut into the metal bezel is a ¼ 20 threads to allow you to attach the light in a horizontal or vertical configuration to a tripod, a hotshoe adapter or any other place where you can put a ¼ 20 accessory. Also in the side is the USB-C charging port. No silicone cover is provided for this connection which is a little unfortunate as it exposes it to dust, and moisture but most Smartphones follow this method and don’t have a problem. The front has 120 LED’s a combination of ½ to provide the warmer tones, and the other ½ to provide the cooler tones. They are arranged in a matrix of every other and are even for the most part. They are slightly rearranged around where the threaded insert is inserted. Over the top is a piece of clear acrylic and it shipped with a piece of protective plastic over the top. I am leaving this on mine to provide a bit more scratch resistance. The back is a solid piece of milled aluminum that has a small OLED screen that’s used to tell you what mode you are in, power level, brightness, tint temp, and estimated runtime. The internal non user replaceable battery is rated at 2600mAh of capacity. I measured the Length at 131mm, width at 66mm, and depth at just under 10mm. Weight came in at 142.9 Grams. The exact LED’s used in this are not mentioned which is a bit of a disappointment. It would be really nice to know what the CRI on them is as well. For video and photo work you ideally want a high CRI LED, and these are more of a cri in the 70-80 range I would guess. There are a total of 120 LED’s on the light, with 60 being used for Warm white, and 60 being used for Cool White. The array is fairly even but there is some rearrangement that happened to accommodate other components in the casing. The light will also run while plugged in to USB-C so it could be nearly endless amounts of runtime if you wanted. I did 2 runtime tests with this light, both at 100% brightness with one being the warmest temperature, the other being the coolest. So for the 3000k test, total runtime was right at 70 minutes. 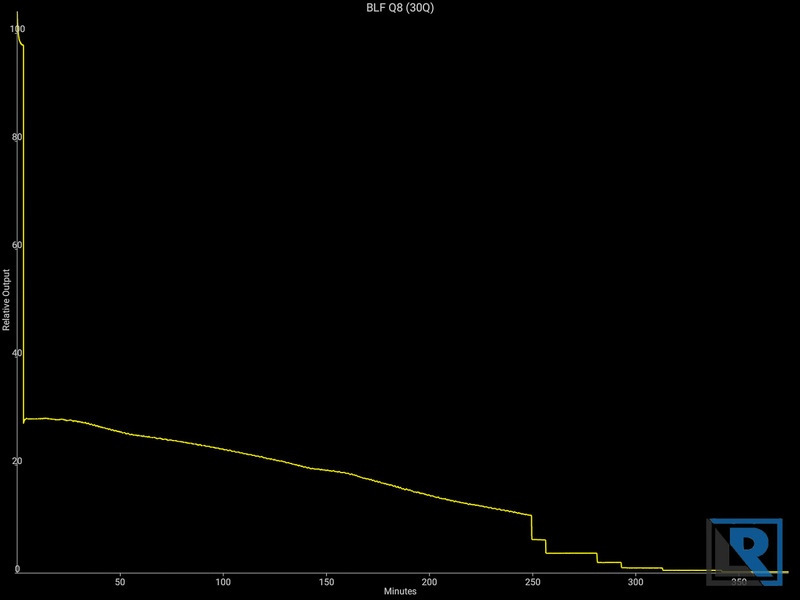 During this time output gradually decreased despite being at 100%, it lasted 65 minutes at 80% relative output. This is a little better then the OLED screen predicted. The 5500k runtime test was very similar, 70 minutes of total runtime, and the light slipped to just under 80% relative output at about 50 minutes. UI is very easy on this. You have 4 buttons along the side of the panel, that if it’s mounted to your camera horizontally will be on top. You have a power button, pressing once quickly wakes up the interface, you need it on in this mode to use the OTG charger to charge another device. If you press again and hold slightly the light interface comes up. Here you can preset using the + and – icons which options you are on, press the mode button to select it and then use the + and – to adjust the brightness and tint temp. Press mode again and then + or – to adjust the other. Press the power button once more to turn it on once you have your settings preselected. It’s pretty intuitive when it’s in your hand. You can adjust brightness and tint temp on the fly while the light is on as well to get your perfect exposure. The FL-12 comes with a USB-C 3 where the other two ends are a full size female USB 3.0 port, that allows you to plug in a standard USB cable and use the FL-12 as a powerbank to charge your phone, or camera that can be powered by USB. You can’t charge your device and use the light on the FL-12 at the same time unfortunately. The other end allows you to charge the FL-12 via a standard male USB connection if you don’t have a USB-C cable handy at the time. 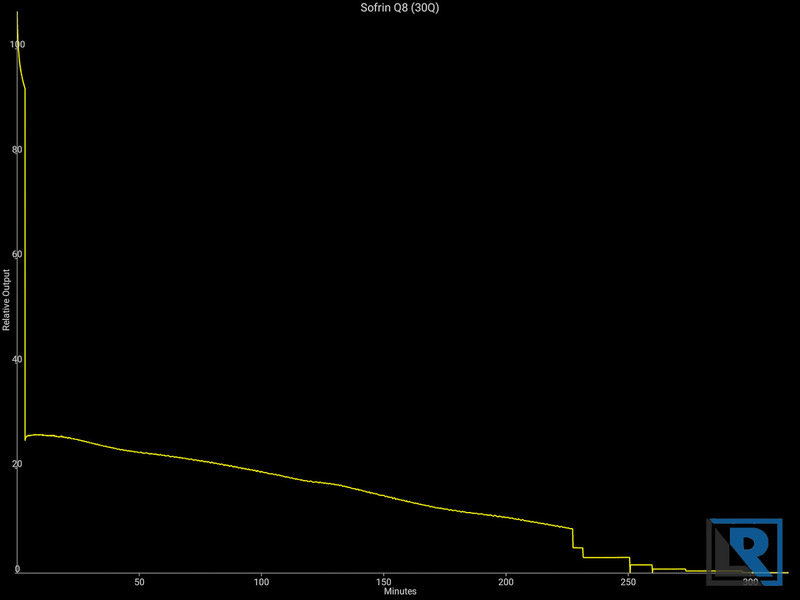 I measured charging speed at 0.8A which isn’t super fast but should be good for the long term health of the battery. USB-C recharging and can act as a powerbank! Nice OLED screen on the back for info & runtimes that the light beats slightly. Plastic front panel is susceptible to scratches, I left the protective cover on. I would like to know more on what the CRI is. I would suspect its between 70-80. No cover for the USB-C port, although most phones get by fine without this too, so not a big concern. I have showed this to a few friends who also do video/photography work and they instantly wanted one. They were both pleasantly surprised at the price point when I told them. It’s around that $50 mark currently with Jetbeam’s website. It’s well built and reminds me a lot of a premium smartphone. My only major complaint is no CRI data is given. CRI is pretty important invideo work, especially if you shooting video of people for something like an interview. My guess is this is somewhere about 70-80 CRI, it’s not bad but could certainly be better. Other then that I think it’s pretty awesome, I plan to use it as a fill light for photos and I may use it as a top down fill for some video content as well. Having a small portable light will come in handy! Nitecore has a new addition to their keychain/small EDC lights with the TUP. It is capable of delivering 1000 lumens briefly, and has a small OLED screen to let you know what mode you are in, lumens, and how long the light will run in that mode. Thanks to Nitecore Store for sending this to me to take a look at. Packaging is a little different from the black and yellow Nitecore boxes many lights come in. Instead it’s a black box featuring the light on the front with some stats on the back. Inside the light is held in place with a clear plastic shell with accessories below. Accessories include the light itself, the pocket clip comes pre attached, a micro USB cable a manual and associated paperwork and a quick keychain attachment. Nitecore store nicely includes a quick start guide which I find helpful, especially when exiting the “demo mode” the light comes in. The TUP features a construction similar to the other keychain lights Nitecore has come out with in the last few years. It’s a 2 piece aluminum clam shell that’s anodized black. It’s held together with T3 Torx screws. I didn’t do a disassembly as it’s been done before by others. In the hand it feels pretty solid, the buttons have a nice click to them and the OLED screen is mounted flush with the body body. The buttons are almost too easy to press, so using lockout mode is a good idea. I would expect the aluminum and screen will scratch if you did decide to put this on your keys as that’s a pretty rough environment. On the back of the light there are 2 small rings where you can attach a ring to then attach it to your keychain via your favorite method. The clip is large and substantial on the back side of the light. It allows for a deep carry if you desire to use carry this in your pocket. Overall it feels pretty solid for a clamshell type light. Length is 70.3mm, width is 26mm and thickness is 25mm at the head without the clip. Weight is 53.2 grams. The light is IP54 rated meaning it can withstand dust, and splashes of water. Nitecore says this is a keychain light, and while you could use it for that I feel it’s thickness makes it less then Ideal for that in my opinion. I would use this more as an EDC then a keychain light. Compared with the Nitecore TIP you can see how much thicker the TUP is by at least 50%. Even the TIP is larger then I want to carry on my keys. For the last several months the Olight i1R has been my keychain light because of it’s small size. Comparing it to a normal household key it’s just a little longer in length but it’s the depth that sets this apart. The Nitecore TUP uses a Cree XP-L HD V6 LED in cool white. It’s reflector provides for a hot center and minimal spill, kind of similar to a TIR style optic. The front lens is plastic which I would have some concerns about scratching if used on a keychain. Since Turbo only lasts for 30 second heat isn’t a factor here. Runtime I measured on high, at 200 lumens which was pretty consistent for 3.5 hours starting on high of 200 modes and having it step down as the 1200mAh battery depleted. LVP kicked in at 2.9V according to the voltage on the OLED display. I didn’t do a runtime test on turbo because you can’t lock it on, it’s basically a momentary mode only and only for a max of 30 second at a time. You can retrigger this several times but the output will decrease as the light heats up and battery loses voltage. This light ships with 2 UI, the default being “Demo” mode. Given the package is a sealed box without a window, I can’t think of a legit reason why the light has a demo mode, and why it would be the default. Nitecore says this is for EDC use, but I would prefer to manually turn the light off, if my task takes longer than 30 seconds. For practical use the user needs to switch it into normal mode by pressing both buttons at the same time while the light is off. Normal mode is more straightforward and what you would expect. The light starts in moon light mode and linearly goes up. Moon mode is 1 lumen, then 15 lumens, 65 lumens, 200 lumens, and momentary turbo of 1000 lumens. The light has memory in this mode and will remember where you were last at. It has 2 buttons, basically a power and a mode button. The light has direct access to low and Turbo. To access low, when the light is off (and not locked) press and hold the power button to access 1 lumen mode. To access tubo press and hold the mode button, and this is in momentary. The light also has 2 lockout modes. Lock 1 is half lockout mode. It locks the power button but if you press and hold (about 1 second) the mode button you get access to turbo. To exit lockout you have to hold both buttons at the same time. In lockout mode 2 the light won’t turn on until unlocked. Recharging was accomplished with the included MicroUSB cable. The internal non replaceable cell is rated at 1200mAh by Nitecore. Charging speed from the LVP at 2.9V was right at 3.5 hours at a rate of 0.5A. This is an appropriate charging speed for a small capacity non replaceable pouch style battery like this. The light is able to turn on while charging or being powered from a USB power source. The TUP is a bit of a fatty, It’s really not that much larger then a lot of the CR123 based lights such as the Olight S1R II, or my 4Sevens MiniMK Turbo, but I just don’t like it as well for a front pocket EDC. I think it’s the square vs rounded shape. The Clip on the TUP is substantial and should hold up pretty well. As a keychain light in my opinion it’s too thick. Length is ok, but it’s just more bulk then I want on my keys that sometimes end up in my front pocket. I think the size would be ok if you always put your keys in a jacket pocket or purse where overall size isn’t as important. Is able to power on while charging/running off a USB power source. I like the OLED screen that shows lumens and estimated runtime. If this proves to be durable more lights should have it. Nice beam pattern that throws quite a ways for a small light. Great clip and construction, makes for a great hat light. Buttons are too easy to press meaning lock mode is recommended highly. I would prefer having to hold lock mode a little longer so it’s not triggered accidentally. It’s too large for a keychain light, at least on my keys. The Nitecore TUP is the largest of the keychain style lights from Nitecore and for me it moves out of that keychain style light into the gray area between categories. You could use it as an EDC, it’s similar in thickness to some CR123 based lights but the square ish edges makes it seem a little larger. The clip is good and allows for a deep carry in a pocket or it makes it easy to clip on to a hat. It provides a solid runtime for this and a variety of modes. I just find myself reaching for a dedicated headlamp most of the time though. We saw on the TIP Nitecore offered a high CRI version with a warm tint, my hope would be they offer the TUP with this as well in the future because I have a personal preference to high CRI. The screen makes the UI easy to use on the TUP and I think it would make a nice complete gift as you know what’s going on by looking at the screen vs knowing a blink pattern for lockout mode or low battery indicator. This might be my last review & Video of 2018 (or I might get one more done next week). It’s been a good year, a busy year too. I made a total of 65 videos and reviews (Not all were flashlights, but most were). Let’s see what 2019 holds. Thrunite has a new 18650 light on the market, boasting an incredible 2300 lumens from a single emitter, onboard microUSB charging, in a pretty compact package. Thanks to Thrunite for sending this to me to review, let’s take a closer look. Packaging is similar to past Thrunite lights. It’s a nice brown cardboard box, with few facts on the outside other then the model number, picture and emitter type. Inside the light is protected in black foam, with all the accessories underneath. Included with the light is a Thrunite button top protected 3100mAh IMR battery. The wrapping on this one is thin, and I can see the model number underneath indicating it’s a Samsung 30Q which is great. Other accessories include the nylon holster, with the velcro belt loop, and plastic dring, Extra orings, a pocket clip, Lanyard, micro USB cable, extra button cover and USB cover, and associated paperwork. The light comes with a Thrunite button top protected branded IMR battery, the wrapper is kind of transparent and you can see the pink Samsung 30Q underneath. I am a big fan of 30Q’s so that’s great. The light is built from aluminium, anodized an egg shell black, the same as other Thrunite lights. The tail allows for the light to tailstand but it’s not magnetic. There is a recessed area where I could see someone epoxying a strong magnet too if they wanted. On the tail cap is also the lanyard attachment point. Inside the tail cap there is an additional plastic ring used to hold the spring in place. Threads on the body tube are anodized and square cut. The grip pattern on the body tube is a small series of squares milled in, with the edges all nicely deburred. This reminds me a lot of the Olight M2R’s body tube with a slight twist in design. It provides a medium amount of grip and should not rip up your pocket. The pocket clip is designed to fit this light on the tail end only and uses a little wider attachment point. For me I wish the clip allowed for a bit deeper carry. About 18mm of the light sticks up above the clip. The head is allowed to separate from the body of the light. From what I can see inside it’s mostly brass contacts. There is a slight raised area in the center to act as a contact point. From the outside it’s similar to other Thrunite lights, there is an anti roll ring where you can find the button and USB charging port. The button is a silver metal, and features a LED in the center used for battery status. It’s almost flush, and won’t get caught accidentally. The charging port cover has a little different design. Instead of one weak attachment point like a lot of lights use, this has a rubber/silicone band that fits the entire way around the light that the cover attaches to. This means it gets out of the way further when charging. I like that change. The front of the bezel is smooth with minimal fins. The lens is anti reflective coated, the reflector is deep and smooth, and the LED is nicely centered. Minimal writing on the light only the model number under the button, and under the charging port is the SN, and 3 regulatory markings. If you drop the light from just a few inches when it’s on, onto the tail cap it will temporarily lose contact and go out for just a second, it comes back on as soon as the battery makes contact again. I think a stronger spring would help this or a spring in the head as well. I measured the length at 123mm, maximum diameter at 26mm at the anti roll ring, and minimum diameter at 25mm on the head. Weight with the included battery and clip was 125g. Comparing it to the Olight M2R (in the video version), the TC15 is shorter by about ¼ inch, diameters at the heads are very similar with the Olight being a touch larger, but you notice it more in the anti roll ring and body tubes with the Olight being the larger of the 2 as well as weighing more. Comparing it to the Olight S2R the TC15 is a good deal shorter but similar diameters. Compared to the Acebeam EC35 the Thurunite TC15 is shorter by about a ½ inch and smaller in diameter too. This light is using a Cree XHP35 HD LED in my example in Cool White. Thrunite on their website has a Neutral White model listed but it’s not yet available. Maximum brightness is listed at 2300 lumens but according some other reviews such as Zeroair it may be under rated as he saw 2700 lumens at the beginning of Turbo mode. The beam on this has a hot center, and a reduced spill. It surprised me at how well it throws light at distance. Thrunite rates it at 246m and that’s thanks to that smooth deep reflector and XHP35 HD LED. With so many lumens out of a small package this light does get hot. After 1 minute starting on turbo I measured it at 102F at the head, after 5 minutes I measured it at 113F, and after 10 minutes I measured it at 116F. This is getting fairly roasty but won’t burn you. Runtime on this light is pretty solid considering it’s lumen output. On Turbo the light steps down after 2.5 minutes and then stabilizes for about 95 minutes. The last 10 minutes of that the light starts to sag a bit as the battery depletes but not too much or noticeably. At the end the LVP kicks in and the light shuts off. Mode spacing is as follows. Turbo 2300 lumens, then 820 lumens after 2 minutes. High 1050 lumens, Medium 250 lumens, Low 25 lumens, firefly/moonlight 1 lumen, and strobe 839 lumens. UI on this light is the same as most Thrunite’s, which is good, nothing new to learn and it’s a good UI in my opinion. From off, long press to get Firefly mode, when the light is on press and hold to cycle the light through the different modes, going low to high. Double click to get to turbo, once in turbo click again to go to strobe. Recharging via microUSB performed pretty good. I saw an average close to 1A for charging, which means it took about 3.5 hours to fully charge. This is a safe charging speed, and it won’t win any awards for speed but it should mean your battery will have a long healthy life. High Quality Samsung 30Q battery. Good UI and mode spacing. To move from good to great EDC for me this would need to have a pocket clip that allows it to go deeper in the pocket. The Thrunite TC15 is a pretty nice complete flashlight package. There are not a ton of similar lights with this emitter and size that are non tactical oriented. I like the longer throw that this offers in a fairly small package and small diameter but you pay for that with the light being a little longer then I would prefer for a pocket light. I do wish with this longer light you would get a spring in the head which I think would help with the connection issues when the light is dropped from it’s tail. I wish a deeper clip was offered as well to improve it’s EDC ability. Overall this light is a pretty good value for a complete package from a good brand with a great reputation and good customer support. ThruNite is running a Christmas promotion on their website where you can use the code “20%” to save 20% when ordering direct from them (On most lights). I don’t get any kickbacks from this or anything like that I just want to make sure people can get a deal when one is available.